Corvus brachyrhynchos — it's everywhere in Princeton Landing — on our roads, in our trees and on our roofs. 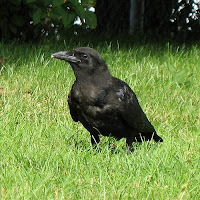 Our Nature Guide Jon Latimer gives us some background on the community's ubiquitous and extremely vocal resident, the American Crow. "The American Crow is one of Princeton Landing's best-known year-round residents. These large birds have black feathers glossed with violet, black legs and dark brown eyes. Both sexes look alike, but males are slightly larger. Crows are often confused with Common Ravens (Corvus corax), but ravens are much larger and have longer wings and heavier beaks. A raven's tail is tapered at the end, which gives it a diamond or wedge shape compared to a crow's shorter and squarer tail. "American Crows are a very social species and live in extended family groups. Pairs mate for life and establish a new home territory and nesting site each year. Young crows, which do not breed until they are from two to five years old, often stay with their parents and help them raise later generations of nestlings. Families may include more than a dozen individuals and contain young from as many as five different years. During winter they congregate in large numbers and sleep in communal roosts. "American Crows are considered one of the most intelligent birds, although there is little scientific evidence to prove it. They are good learners and problem-solvers, and are especially resourceful in their food habits. Some crows have even been known to make and use tools. "The nest of the American Crow is a bulky construction that resembles a basket of sticks. Both parents build the nest, but the female does most of the work, especially near the end when they are lining the nest. The whole process can take more than two weeks to complete. 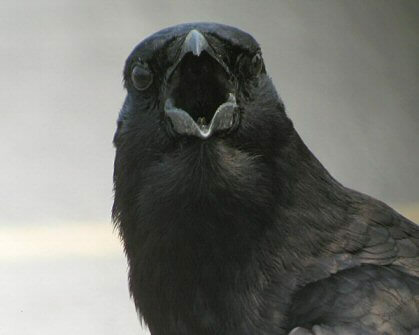 "The common call of the American Crow is a harsh 'caw,' but they also make a variety of rattles, coos and clear notes. Crows are aggressive and often chase away larger birds including hawks, owls and herons. If you hear a number of crows cawing loudly, you may find them harassing a Great Horned Owl — we have at least three living in our vicinity." I love this post. Crows are wonderful, fascinating, intelligent birds. If you're interested, check out the website for the American Society of Crows and Ravens.